Despite its flashy, copper facade, OOPEAA’s Suvela Chapel, located on a former parking lot in the Helsinki suburb of Espoo, sits lightly in its surrounds. The U-shaped volume fully extends to the perimeter, allowing for a peaceful inner courtyard. Occupying one arm of the U, the soaring main chapel projects onto the street-facing northeast corner. Offices reside in the connecting mid-section, while tranquil community spaces are situated in the other arm. Juxtaposed against the modesty of the church’s single level, sweeping changes in height deliver architectural drama: while the office wing has a standard ceiling height of 2.8m, the chapel vaults up to 12m. 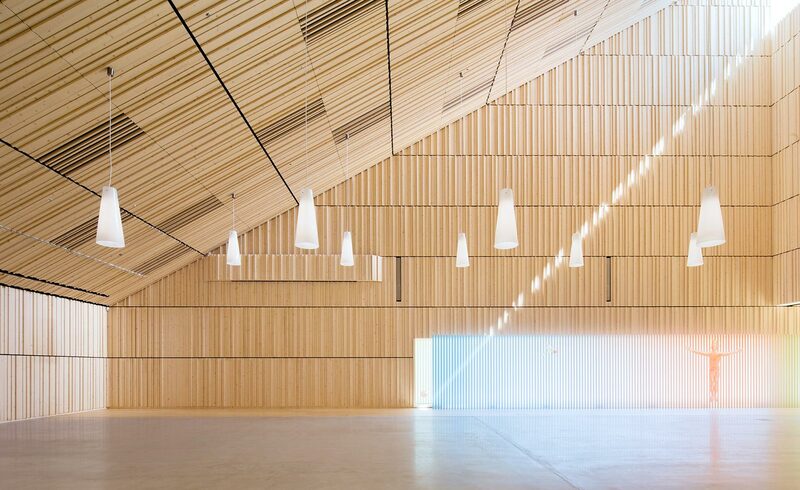 The relatively restricted materials palette of copper and Finnish spruce further heightens the striking contrast between exterior and interior spaces. While the copper steals the limelight street-side, the chapel’s contemplative interiors are clad in spruce. In time, however, the copper will weather and darken, settling in comfortably to its suburban landscape.